He might have been trailing by five strokes after the first round but that was no deterrent to Dunrobin, Ontario’s Allen McGee in his pursuit of becoming the first winner of the Stanley Thompson Trophy. 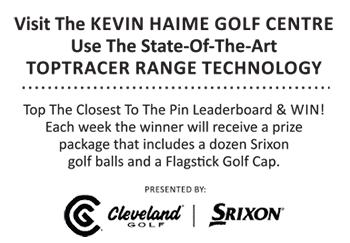 The prize, emblematic of the overall win at the Flagstick Golf Magazine BCC Open presented by Nike Golf Canada, was exactly what McGee was after, and what he earned the right to hoist on Sunday after a closing round of 69 at the Brockville Country Club. McGee, a six-time winner of the Ottawa Valley Golf Association City & District Championship, caught and surpassed first round leader Adam Folco late in the final round, punctuated by birdies on the 34th and 35th holes of the championship. On the very same holes Folco, the 2012 Club Champion at the host course, would make a double bogey on each to help pave the way for McGee on his path to the title with a final score of 145. Folco completed play at 150 while Greg Spencer and Dwight Reinhart followed at 153. McGee, also the winner of the very first Flagstick Golf Magazine Shootout at Smuggler’s Glen four years ago, was understandably ecstatic with the victory and attributed it to his putting on day two. In Flight Competition Adam Folco captured top prize in A Flight. His fellow Brockville Country Club member, Mike O’Reilly, was the best of B Flight. Richard Pope won the C Flight while Justin Bhatt garnered top honours in D Flight. Trophy artisan David Sheridan and John Smith, a representative of the Stanley Thompson Society, were also on hand for the award presentation.